1. 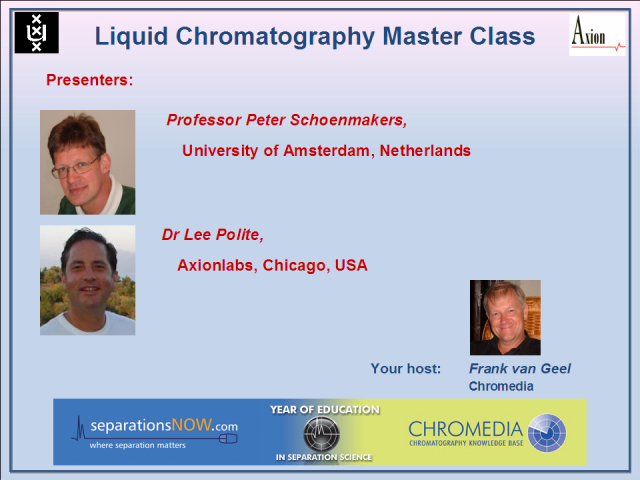 Answers to your questions asked in Professor Schoenmakers' Introduction to Liquid Chromatography webinar. 2. An interactive Q&A session for Dr Polite's "Resolution in Liquid Chromatography" video tutorial. Chromedia, for a limited time only, will provide Dr Lee Polite's video tutorial Resolution in LC available completely for free! Doping control analysis predominantly utilises chromatography and mass spectrometry-based approaches to detect prohibited substances and methods of doping. These compounds and methods present both low and high molecular weight analytes of xenobiotic or natural / endogenous origin, which are to be detected, and occasionally quantified, using state-of-the-art instruments. The majority of the employed tools provides low resolving power. However, high resolution / high accuracy mass spectrometry has gained much attention recently due to: constantly increasing analytical requirements concerning the number of target compounds; the complexity of analytes (e.g. peptides and proteins); and the desire to accelerate analyses and obtain information (allowing for retrospective data mining). A selection of compounds, new challenges, and methods currently employed in doping control laboratories will be presented to the audience including, for example: new anabolic agents referred to as selective androgen receptor modulators (SARMs); insulins; so-called "releasing peptides" that stimulate the endogenous production of natural hormones; and ways of manipulating drug tests. Sample preparation is the most important, yet often most neglected area of chromatographic training and method development. The world's finest gas and liquid chromatographs generally cannot overcome mistakes made prior to sample injection. * Sorptive micro-extractions (SPME and SBSE). Discussion will directed toward seeing the commonalities among all extraction techniques and toward choosing the best technique for a given analytical problem. Fundamentals of sample and glassware handling will also be reviewed. This webinar is directed toward analysts who use these techniques hands-on every day and to the laboratory managers who must teach, train and supervise them. * An overall perspective of current usage and applications of the various techniques. * A description of how the techniques developed, starting from paper chromatography up-to current "high tech" two-dimensional separations. * A more detailed focus on the concept of various methods. Often portrayed more as magic than science, popular television series such as CSI have aroused great interest in analytical chemistry. Forensic science relies on separation science. Peter Schoenmakers' webinar will also, in a light-hearted manner, put LC methods into the correct perspective for forensic science. The first activity in the Year of Education is a series of free educational webinars, run in conjunction by separationsNOW and Chromedia. In the first webinar, Professor Harold McNair gives an interactive lecture on the basics of gas chromatography. * Use chromatography and would like to revisit the basics of GC. * Have a little knowledge and would like to learn more! Some knowledge of general and organic chemistry is assumed. The webinar should prove useful to technicians, students, graduate students, PhDs and even professors planning to work with GC. "The first activity is a free webinar on gas chromatography, followed by a number of other activities, more webinars, online short courses, tutorials, instruction videos and much more! 2010 will be a year full of activities. Many experts will be involved, from university and industry. We believe all chromatographers should actively take part in this: in teaching, telling their employees and students to take courses. This is a chance they should not miss!"